There are some basic tips on necklace lengths when choosing a necklace that’s right for you. The choker 16”/40.5cms is classic and versatile, a 14-16 inch choker falls perfectly around the base of the neck. A simple choker necklace gives the finishing touch to any outfit and just most necklines, chokers are the perfect everyday necklace and work as well with a business suit as a t-shirt and jeans. 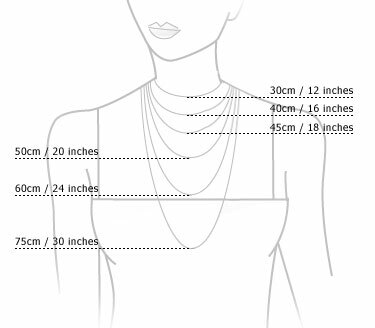 18”/45.5cms – A very popular length of necklace. This length falls just below the throat. Looks equally good with high and crew necklines or low plunging necklines . This length also looks great with a tailored jacket. 20-26”/51-66cms – This length of necklace is a good choice for casual or work wear. It looks great layered with shorter necklaces for a bold, eye-catching look. 28-36”/71-91.5cms – Transform this length necklace from day to night by wearing as a single or double strand. 40-46”/1.2m – Dress up your outfits with this longer length versatile necklace. Fits easily over your head without the need for a clasp. 48”/1.3m – Usually a lariat, which is one long strand which can be worn in a gentle knot or wrapped in different ways to create a very chic and glamorous look. And just like style, the correct length for you is based on your personal taste. It’s also a good idea to have different sizes and styles of necklaces in your jewellery collection so you have the perfect necklace for all occasion. Layering your different length necklaces from short to long will enable you to achieve a totally unique style or wear each one alone to show it off and make a statement. How can I determine my ring size? – That’s easy – just get some string! The best time to measure your ring size is at the end of the day, make sure your hands are not too cold. Wrap a piece of string around the base of the finger, making sure you can slide the string over your knuckle. Next mark the point where the string overlaps with a pen. Making sure you measure from the correct end, measure in mm the length from the start of the string to the mark that you made. Now for the easy part – compare this length with the chart below for your ring size – please order the next largest size if your ring falls between sizes. Will it fit? – We will help you make the right decision. That’s easy – just check in the description of the jewellery you are buying, you will see we have taken the time to add as much detail about the dimentions as possible. You will know you have made the right decision by quickly checking the dimensions before you buy. What if I order the wrong size? – Don’t worry! If you order the wrong size, just return it back to us using our returns policy. If we have the size you require in stock we will post this out to you once your return has been processed. Please email us if you require any further help, we will try our best to answer any questions you may have.